There have been interesting developments in the swift box over recent days. A queen wasp has been building a nest inside the box near the entrance. The swifts seemed to be very tolerant but I was anxious that as time went on the nest would enlarge and disrupt their nesting attempt, at best! 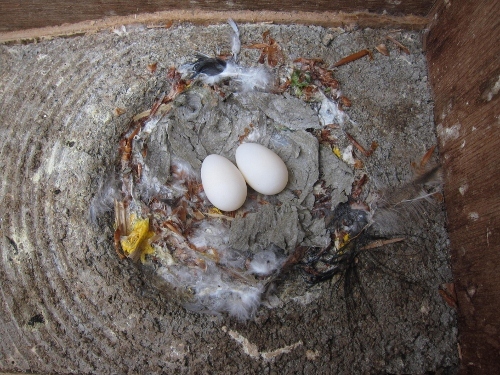 I need not have worried, the swifts dismantled the structure made by the queen wasp and used it as nest material! I haven’t seen the queen wasp recently so do not know her fate. I took this photograph quickly when both swifts were absent. They are now incubating again. Swift’s nest incorporating wasps nest- 1st June. Photograph copyright Jonathan Pomroy 2012.